Disclaimer: due to the nature of my profession, these views are entirely my own and in no way represent the views of my employer. Any of you based in Queensland, or who follow people in the bookselling and publishing industry on Twitter, would now be aware that as of yesterday, newly elected Premier Campbell Newman has decided to scrap the Queensland Premier’s Literary Awards. Established in 1999, the Awards have become one of the leading awards programs in Australia, and cost $244,475 per year. It’s a sizeable amount of money by any standard. It does, however, come from an annual State Budget of roughly $47 billion. Now that is somewhat awkward. And it leaves us as the only Australian state without a Government-endorsed literary award. Is it worth it? Obviously, I’m shouting that no, it’s not worth it. The arts and cultural sector in Queensland has been much maligned over the decades and only in recent years has it really grown up, matured, and started to become competitive on a national scale. It has been a long and deliberate process to help Queensland stand amongst cultural heavyweights Victoria and New South Wales, and we are undoubtedly getting there. I won’t delude myself for a second and think that this will be the only cut to arts and cultural programs – Premier Newman has consistently shown that the key focus for the LNP is a strong economic blueprint to get the State fiscally and financially back on track. As an Economics graduate, I am well aware that a healthy, dynamic economy is key for a productive and efficient State, and I don’t argue that Queensland is in need of some major economic reform. But why, for the love of all things good, stop giving what is, all things considered, an insignificant sum of money to help a pubescent sector mature? And indeed, one of the sectors that has significantly helped Queensland and Brisbane free themselves of the common misconception that we are just “one big country town” and inherently backwards! If you’re bold enough to read the comments (and I never endorse reading the comments), many answers to this question are provided. I’d like to address the major themes that appear to be emerging one by one. Answer #1 – The authors that win don’t need the money because they are already well-known and established. Oh shut up. Seriously. Take a look below at the categories for the 2011 Awards. Winners of the first category, “Fiction Book Award”, include Tim Winton, J.M. Coetzee, Helen Garner, Peter Carey, and Richard Flanagan. Between them they’ve won the Man Booker Prize, the Nobel Prize in Literature, the Commonwealth Writer’s Prize, the Miles Franklin Award, and countless other honours. They are well-known and established and highly successful. But it’s just one category. There are 13 other categories that recognise outstanding achievements beyond the fiction genre and help to foster the talent of up-and-coming writers. There are awards for excellence in history, as well as writing for the stage and screen. The 14 categories celebrate writing in all its forms and reward creativity and originality. Moreover, they help to put Queensland’s literary talent in the limelight and give them the recognition they undoubtedly deserve. Answer #2 – Get a real job. Take your judgement elsewhere – who are you to determine what is and, for that matter, is not a real job? This bothers me considerably, especially since at the Perth Writers Festival, I was involved in a discussion about the number of writers in Australia who are considered professional, full-time book writers. I can count them on one hand. That’s how many people earn their income solely from writing novels. It’s ridiculous to suggest that writers don’t already have real jobs – I know a highly successful Brisbane writer who still works in a bookshop! It’s a poorly paid profession and most writers in Australia don’t come close to scratching the surface of the financial success of their counterparts in America and Europe. Not that they aren’t as successful. It’s a huge misconception that writing is all glamour and money and fame. Writers are heartbreakingly normal people, doing their best to survive in their chosen profession. Their contribution to society is no less important than that of a teacher or a doctor or a bus driver or an engineer. It’s all a matter of perspective. Teachers educate, and so do writers. The effects of engagement with books on the human brain are well documented and highly conclusive, indicating that reading has cognitive consequences far beyond understanding the words on the page. Doctors save lives, and so do writers. While not the most conventional form of healing, writers speak to their readers through poetry, through shared experiences… A simple passage can have a profound effect on an individual. The sales of motivational and self-help books indicate that people are saved by writers on a daily basis. Bus drivers take you places, and so do writers. The increasing popularity of the travel narrative demonstrates readers’ insatiable need for books about far away places. Reading an account of an experience half a world away can transport you to a different place and time and help you see your world a little differently. Engineers create and invent things, and so do writers. There was a human mind behind the world of Harry Potter, and a very human genius created Middle Earth and all the stories around it. Writers change the past, introduce different perspectives on the present and create endless futures. To say writing is not a real profession is to undermine every creative element that has ever touched your life. Answer #3 – Good books will be picked up by publishing houses anyway. Oh, so now you know how publishing houses work? I sure don’t. From my limited experience, I know that it is incredibly difficult to get picked up by a publishing house, no matter how fantastic your book may be, and that the process is a long and draining one at that. In a bookselling landscape that no longer features Borders and has limited representation from Angus & Robertson, publishing houses need to ensure they books they choose to publish bring about the returns required to make a profit. That’s the business world. Publishing house giants like Random House and Allen and Unwin have the rights to publish books by some of the world’s most successful writers. That’s why a series is rebranded, rejacketed, remarketed and targeted to a new audience. Increasing readership increases profits. It’s a simple business equation. That’s not to say new authors aren’t picked up along the way – the sector would cease to exist if this did not occur. But glance over any new release shelf and I guarantee you’ll recognise most of the names. That’s why the work of smaller publishers and literary awards are so vital – with all the content in the marketplace, they look for opportunities in different areas, from different voices. In a video game, you tackle mini-bosses throughout the mission to ensure you’re prepared for the big boss at the end. S.J. Watson aside, your first book might not sell many copies. In fact, it probably won’t. But with the support of a smaller publisher or with the notoriety of an award, your ability to publish increases and your readership will increase and you will work your way up to the big boss. It doesn’t happen all at once. That’s why individual awards across all states in Australia are so vital – each state searches for and represents the best of local talent and, as a whole, the sector starts to embrace new authors and new stories. It’s a critical stepping stone for emerging authors and the literary crowds of Queensland are now at a marked disadvantage. Answer #4 – Stop wasting taxpayer money. Okay. This one is the hardest to tackle. I’m aware of the cycle of dependency that can be fostered in a culture of safety nets and welfare benefits. It is now well documented that the required funding for the Awards is $244,475 per annum. According to the Office of Economic and Statistical Research, the current Queensland population stands at approximately 4.6 million people. “Stop wasting the taxpayers money on handouts” I hear you cry. 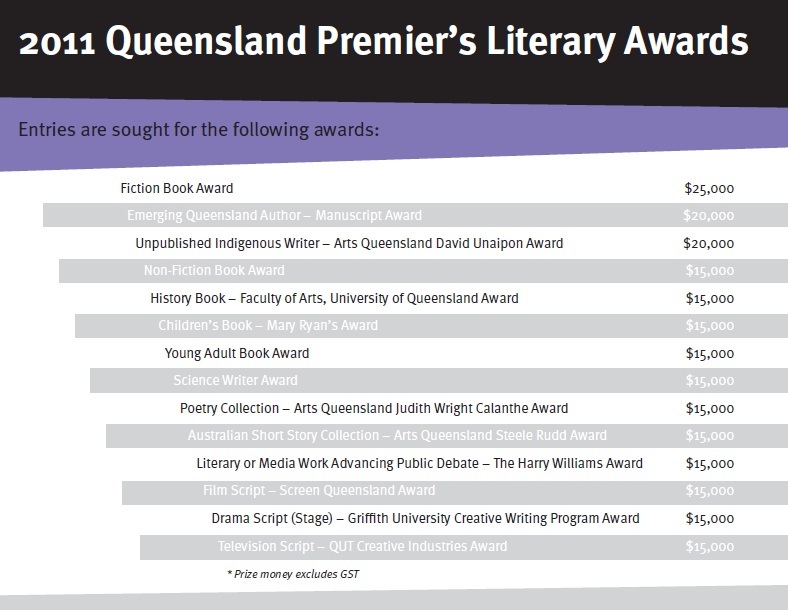 Each Queenslander contributed $0.05314 to the Awards… 5 cents from every Queenslander helped support the State’s literary sector. What can you even buy for 5 cents any more? It’s even less than that when you consider that the Queensland population doesn’t entirely fund the annual Government Budget of $47 billion. Do you get where I’m going here? I understand that the Government has committed to cutting waste and unnecessary expenditure. I agree that there has been a considerable amount of waste and unnecessary expenditure in the Queensland Government for some time. Capping wages growth to 3% per annum will produce savings of $1.2 billion. This is economically and fiscally responsible. Cutting less than $250K from a program honoring and acknowledge home-grown literary talent is a slap in the face to the cultural sector of Queensland. It’s not a handout – it’s an award. A one-time recipient of a $15,000 literary prize is not set for life from Government handouts; they were recognised for their exceptional contribution to a minority field and rewarded for it. Culturally, the economic value of a book does not stop at the price you pay to buy it – attempting to measure the flow-on economic effect of cultural investment is still a small research field, but it exists because people are recognising that the benefits of arts and culture to society go beyond numbers on a page. It’s impossible to quantify; how can you put a price on emotions? How can you value words on a page so brilliant that they bring you to tears or make you laugh out loud? Intuitively, a good way would be to support the sector that produces these items of immeasurable value. 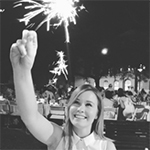 You could send a message to the sector saying that you recognise their contribution to society and that you want to ensure its continuity and viability into the future. The announcement today of the Queensland Literary Awards, coordinated by Matthew Condon and Krissy Kneen, demonstrates the widespread awareness of the necessity of Queensland-specific awards. Similarly, the University of Queensland issued a statement saying that the David Unaipon Award is actually funded by UQ Press and is therefore not able to be cancelled by the Government. The sector has responded. Both critics of the awards and the socially inept commenters will have a field day with this – but as yet the newly established Queensland Literary Awards have not indicated whether similar prize money will apply. Maybe it’s a poor reflection on the state of the philanthropic sector in Queensland. Should the money always have come from the private sector? It’s not an argument that necessarily needs to happen right now. It’s important to remember that this is not just about an award or where the money comes from – it’s about the overall message from the Government to the sector. There are clearly favourites when certain sectors make gains from a loss in another sector. Simply put – there are worse ways to spend your 5 cents.